15 July:The Vice President of India Shri Mohd. 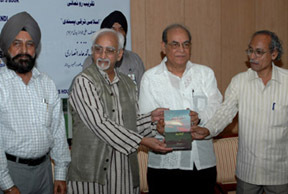 Hamid Ansari released a book entitled “Islami Tarraqqi Pasandi” authored by Late Shri Ali Jawad Zaidi at a function here today. Addressing on the occasion, the Vice President said that this book contains the issues on how to make the lives of common men better and purposeful. He suggested that this useful book should be translated into Hindi and English also so that more and more people may take advantage of this book. The book is the collection of essays with the underlying theme ‘progressive nature of Islamic philosophy’. Progressiveness in Islam has been looked at from various angles and discussed under relevant heads. It shows the contribution that the Islam made to the society and several new concepts which are in currency today. The book is in part an attempt to place the teachings of Islam in their social and historical context, to ensure better and proper understanding about the true nature and essence of Islamic teaching and to bring to light the true import of Islamic philosophy and teaching in the time and environ in which it were expounded.